Lippan kam is a decorative art done by common people mainly women. 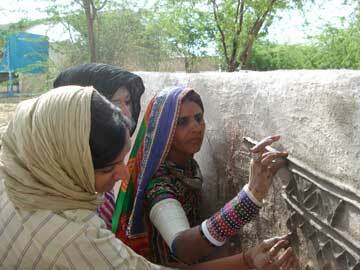 Lippan kam is done inside bhungas/mud huts in villages of Kutch, Gujarat. 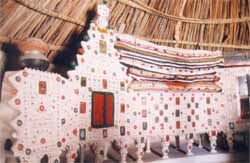 Lippan kam is generally done inside the house but sometimes you can find it on outer walls too. Generally harijan and Rabari women make birds, trees, animals, peacock, human figures etc in lippan kam. 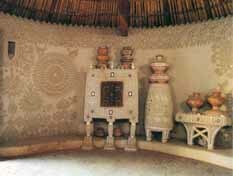 It is done with a mixture of clay and camel dung. Now gum is used to stick mirrors. Small round, diamond-shaped or tringle mirror pieces are essential to lippan kam. Many a times mirror pieces are a little embroidered. It is simple technique, anyone can do it. Can you see slightly raised mud lines-spread with hands. You just need to use the thumb with two fingers! ? See the embroidered mirror here ? I just love-love lippan kam. All of you who go to Kutch, don’t forget to take photos of lippan kam (and don’t forget to send me all images!!). Can we learn this art online????? Pls let me know. Thanks.